Regular lawn care is vital for a healthy green lawn year after year. But after the installation of a new lawn, special care and different rules must be applied to avoid damaging the lawn in its initial stages, because of bare patches, sod die-off, or diseases striking the lawn when it’s young. 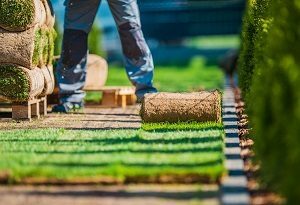 In this blog, we’re going to look at tips for keeping your new sod installation or grass seed hydrated in its beginning months. This assumes you’ve already picked a grass and gotten it installed: if you need help with that, check out our blog, All about Grass: How to Get the Perfect Lawn. Long Watering: Young lawns are very thirsty compared to a mature one. While it depends on if you used seed or sod (see below) until the lawn matures – about a year – expect both longer and higher-than-average watering. Deep Soak: A light watering will only sink down an inch or less into the soil, depending on things light soil quality, sod or seed, and core aeration. The deeper your water penetrates, the deeper the grasses roots will seek it, which leads to healthy grass. Time of Day: Having a wet lawn in the middle of the night can lead to mold and other lawn diseases that thrive in wet and dark environments. Don’t start water until right before daybreak and stop watering shortly after dusk. Use Irrigation: For all of the listed above principles, you can see the need for good lawn irrigation. This means either using an in-ground sprinkler system, above ground systems, or systems like soaker hoses. Regardless of your installation, both grass seed plantings and sod installations have their own complications and watering and care needs. Grass seed has two stages: pre and post-germination. After the grass seed has been laid down, the soil should remain moist – that means light watering 2-3 times per day for 15-25 minutes. You can help augment this by using straw or grass seed accelerator that helps retain moisture. After the seeds have germinated, you can do longer soaks for roughly twice the time a few times per week. Sod has the advantage of already being mature grass, so the critical part here is to promote root growth into your soil for a successful transplant. This is going to require a lot of water to not only soak to sod, but also the soil underneath so the root system will grow. This means watering for 2 to 4 hours at least 4 or 5 times a week. Initially, you can pull back the sod to see how water is penetrating and progress. Need a hand with lawn installations, irrigation, or lawn care? Contact the experts at Greener Horizon. We can also help you with landscape design, hardscape installations, landscape maintenance, and much more. As about our estate management services and contact us now for a free consultation in Eastern Massachusetts and Rhode Island.